Enjoy a special offer valid at Canadian Aéropostale stores. Get $10 off your purchase of $50 or more. Get $25 off your purchase of $100 or more. It is only up to you how much you save! 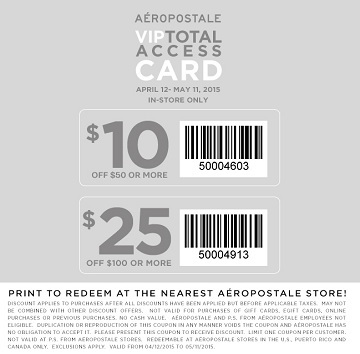 Print the coupon to redeem at Aéropostale store. Source of the information is Aéropostale. More details about this sale at stores.